What does it mean to be a liberal, and how do we react when our core values are challenged and threatened? These are two of the central questions that ignite Zayd Dohrn’s new play, The Profane. 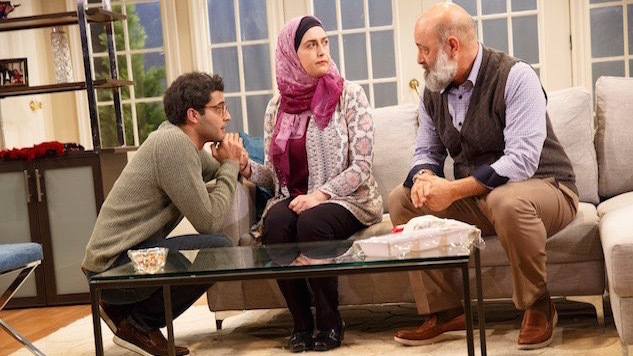 It opens with a parents-meet-daughter’s-boyfriend scene where the twist is he’s from a devout Muslim family. It’s the one taboo for novelist Raif (Ali Reza Farahnakian) who prides himself on raising his daughters to be free thinkers. He and his wife, Naja (Heather Raffo) escaped an oppressive unnamed Middle Eastern country decades ago and have built their life around the freedom afforded by western culture. The first act is bogged down by forced exposition, and Raif’s immediate hostility to Sam (Babak Tafti) feels cartoonish. It’s also odd that he and Emina (Tala Ashe) are supposed to be in college but look around 30. They are in love and wanting to get married. Emina, having grown up in an artistic New York environment, is now drawn to the traditions of Sam’s more formal Islamic upbringing. It’s an odd rebellion, and the reasons for it are not unearthed in any satisfying depth. Instead she appears as a calm and reasoned foil to her father’s fury that Dohrn portrays as irrational. In one particularly overblown moment, Raif rips a page out of the Koran and we are supposed to gasp. The oppression of women and the suppression of ideas, especially ones that question the prophet, are hardly explored outside of Raif’s anger, and the audience is meant to feel that he’s showing the same kind of intolerance to Sam’s family that was shown to him in his home country. But it’s a false equivalence and one that deeply undermines Dohrn’s ability to create compelling characters. Missing is the reasoned argument that no right is absolute and is limited by how it infringes on the freedom of others. Tolerance is a liberal value but so is standing up for civil and human rights and gender equality. Liberals are currently fighting over where the balance between these two principles lies, but sadly, The Profane, does little to enrich the conversation. It’s a shame because scenes towards the end of the first act and into the second show that Dohrn has a talent from writing tense and engaging scenes that play well under Kip Fagan’s deft direction. Naja is one of the more interesting characters, quiet and thoughtful but resolute in her convictions. She both agrees with her husband and feels contempt for him—both ideological and personal. Heather Raffo plays her with a charged nuance, conveying multitudes with a weighted stare or sideways glance. She’s also a playwright and her one-woman show 9 Parts of Desire is a vivid peer into the day-to-day lives of Iraqis and her conflicted feelings about the country as an Iraqi American. While there are many engaging stretches that give The Profane momentum and make it fairly easy to watch, I kept craving real tension instead of the manufactured antics on display. Through: May 7 at Playwrights Horizons.